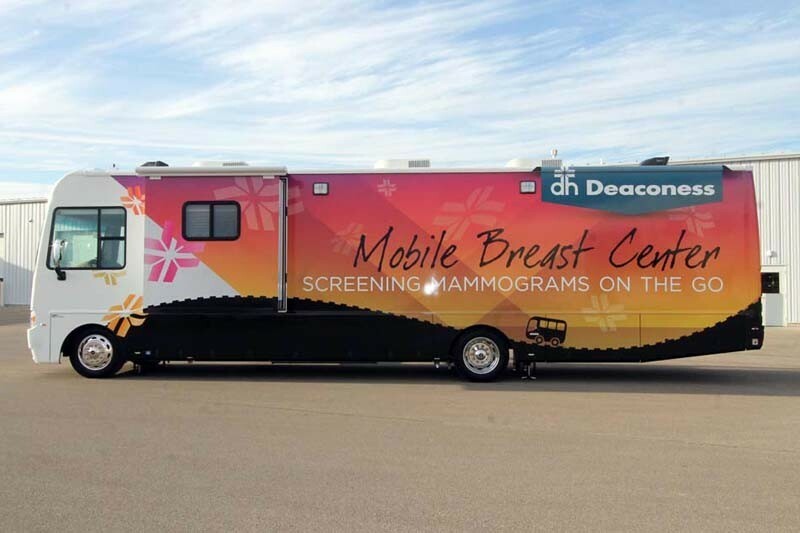 Deaconess Breast Center - Screening Mammograms on the Go! * Must be a woman age 40 or older. A physician referral is not required but you must have a physician for reporting purposes. * Must be one year since your last mammogram. * Must not be pregnant or breastfeeding. * No new breast lumps or concerns. Patients should promptly contact their physician for evaluation if experiencing breast problems. * Must be able to go up and down stairs to enter and exit the coach. * Do not use powder or deodorant in the underarm area or on your breasts. This could create a misleading examination result. You will be asked to undress from the waist up for the mammogram, so it may be more comfortable to wear slacks or a skirt, rather than a dress. * To protect your privacy and comfort, a professional team consists of women only operate the mobile breast center. A female technologist will take a brief history prior to the exam. The entire process usually takes about 15 minutes. * After your mammogram has been reviewed by a radiologist, your personal doctor will received a report of the findings and your results will be available in your MyChart account and mailed to your home address. If you don't have a MyChart account, please ask the technologist for more information. An annual screening mammogram is covered by most insurance companies. For your convenience, we will file a claim with your insurance provider on your behalf. if you do not have insurance you can still receive a screening - thanks to dedicated grants and other fundraising efforts.